The Compact Home Cinema Screen by Screen International is a High quality Electronic screen designed for home cinema systems. The Compact Home Cinema is an electric screen dedicated to the Home Theatre market and it is the right alternative to the Compact Tensioned screens because it is idealised by the high quality features like the other models but still contains the simplistic design and structure which can be easily identified with professional screens you would see in Cinemas. A wide choice of screen surface fabrics are available with the Compact Home Cinema! In addition this screen has a quiet motor so no noise disturbances can be made! The Compact Home Cinema Screen by Screen International is a High quality Electronic screen designed for home cinema systems. The Compact Home Cinema is an electric screen dedicated to the Home Theatre market and it is the right alternative to the Compact Tensioned screens because it is idealised by the high quality features like the other models but still contains the simplistic design and structure which can be easily identified with professional screens you would see in Cinemas. A black drop on the top of the surface of projection allows to install the screen in false ceiling and rooms with high ceiling because, in this way, the surface of projection will be positioned on the right height. Moreover, the side black borders let perceive a brighter and sharper image. Additionally this product comes with a 30cm black leader as standard and 5cm borders to each side. Furthermore this product is equipped with sliding brackets for ease of install and has a white aluminium housing with matching white steel endcaps. In addition this screen has a quiet motor so no noise disturbances can be made! A wide choice of screen surface fabrics are available with the Compact Home Cinema, the standard screen surface is A Matte White with a Gain of 1.2. Additional surface options are as follows; White, Matte White, Lumi-grey, Microperforated, Cinesound, Deep Space 3D, High Matte and Hi-light. The Matte White PVC fabric for front projection provides optimum gain and a good viewing angle. Matte White PVC fabric is a solution for rooms in which there is a sunlight interference behind the screen. It has good mechanical and chemical characteristics (no waves in big measures too). With movies now being made with 3D technology and the invention of HD (High Definition) and Blu-Ray technology, more and more people are purchasing projectors to create their own home cinema feeling. Here at Stage Shop we like to provide our customers with the best guaranteed service. There is no job too big or too small for us here at Stage Shop. 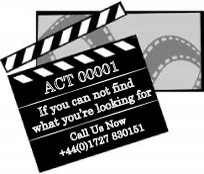 We have worked with; Vue, Odeon, Empire, Picture House, Showcase and many more! Here at Stage Shop we offer everything for your projection needs! From Screens, Projectors, Cases, Brackets, you name it we’ve got it! Advisory and recommended items are added to each product for your convenience! If there is any information you may need on any of our products please call us on 01727 – 830151 or contact one of the team at info@camstage.com.